The Sandman Chronicles: So who won the Oscar for best-dressed? The red carpet has become a major advertising opportunity for fashion brands, who will do anyhting possible to get their stuff on the most famous and likel to be awarded people attending. It is a battle field strewn with the "corpses"of stylists, hairdressers, make up artists and personal assistants, who wage the war behind the scenes. Let's see who won this year (all photos courtesy of wwd.com and Donato Sardella). For me the first place is a tie - Two amazing women ruled the red carpet. First up it's Lupita Nyong'o in custom made Prada (she said she helped design the dress with a concept of bubbly champagne and the blue she was surrounded with growing up in Kenya) and Fred Leighton jewelry. Absolutely stunning. The way she moved with it showed an amazing command of the dress. She's an Audrey Hepburn in the making. The second lady up up up there at the top of the best dressed is Charlize Theron. Wearing black Dior Haute Couture and Harry Winston jewelry, she is pure Hollywood royalty. Naomi Watts in Calvin Klein Collection by Francisco Costa and Bulgari jewelry is a vision in white. Elegant, stunning, gorgeous. Usually her fashion choices leave a lot to be desired but last night she was a winner in the fashion category. Sandra Bullock nailed in Alexander McQueen and Lorraine Schwarz jewelry. Her hair looks great too. I think it needed a cuff instead of a bracelet though. This one combines a 70s vibe with that old Hollywood glamour of the 30s we know and love so much. Kate Hudson is breathtaking in Versace and Neil Lane jewelry. It looked equally good without the cape. Wonder how she got to wear Chanel Couture while not being nominated - maybe just presenting an award clinched the deal. Ethereal. Her hair looked better on TV. Her jewellery is by Tiffany & Co. Pity she did not have her best accessory with her (Justin is on tour). Amy Adams looks stunning in blue Gucci Premiere Couture and Tiffany & Co. Blue was the colour of choice this year, particularly in navy or ultramarine shades. Darren Le Gallo looks dashing too. More elegant gents at the end of the post (ladies first always!). I really love Karen O and she did not dissapoint me at her first Oscar ceremony - her performance was great, singing The Moon Song from the film Her gown is by Camilla Stærk, with Forevermark jewelry. She looks like coming out of an old Holywood film, very Art Deco-late 20s-early 30s. Her red gown during the performance was great too. Speaking of the 20s, Jennifer Garner's Oscar de la Renta dress has that flapper vibe but her hair-don't misses the point completely. Otherwise it looks fantastic. I love Jennifer Lawrence and this Dior Haute Couture dress with Neil Lane jewellery (back necklace again, feels so last year). looks good on her but I think she needed something better for the ceremony. Her Hillary Clinton (thanks Peter Davis for the comment!) hair does not help either. Emma Watson's Vera Wang dress, with Chanel jewllery, is one of those dresses that look great in movement and on film but not in photos. She looked absolutely stunning walking down the Oscars stage to present an award. Love the bold red lipstick too. Cate Blanchett's Armani Privé dress would have been perfect if it did not have those weird things embroidered on it - there is such a variety of things ot pick when embroidering a couture dress. Her giant opal drop earrings from Chopard are stunning. Amazing hair and make up too. Divine. Kerry Washington was one of two gorgeous pregnent ladies attending (I know there was a third but the dress was a disaster). She is in a custom made Jason Wu dress (his first Oscar dress) and Jennifer Meyer jewelry. The second beautiful and elegant pregnatn lady was Olivia Wilde with a dashing Jason Sudeikis bu her side (in Prada). Olivia is in Valentino and Lorraine Schwartz jewelry. On with the gents now - Ewan McGregor wins hands down, with his sharp tux. Could not find where it's from. Wouldn't mind seeing him in a kilt on the red carpet too. His lovely wife Eve Mavrakis is wearing Marni. Joseph Gordon Levitt is elegant and sharp in Calvin Klein Collection. You can do no wrong with Tom Ford. Yes Bradley Cooper, you got it right this time. 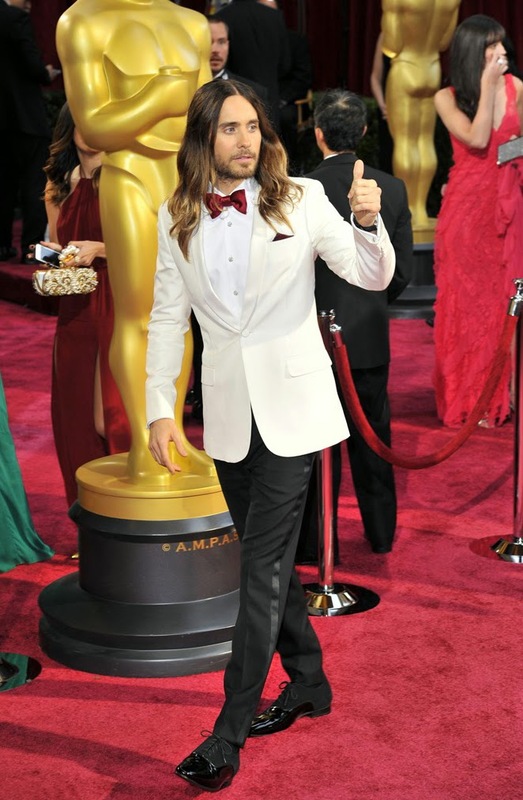 Oscar winner (much deserved) Jared Leto looks dashing (if only he'd cut that hair) in Saint Laurent. Kevin Spacey was a bit drunk but looked smart (and a bit retro, reminding me of his Bobby Darrin role) in Burberry. Most handsome actor ever (they should give him that award at least) is always Michael Fassbender. Wearing a Tom Ford tuxedo does not hurt either. 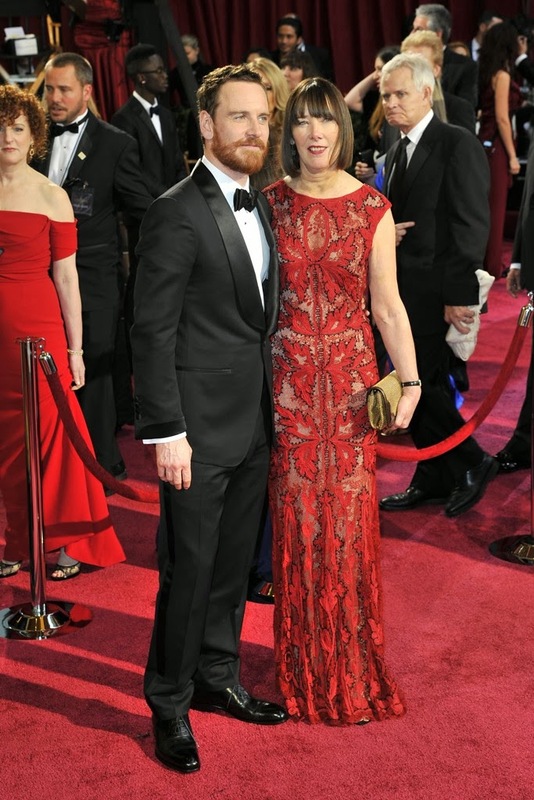 With him is his mother (we thank you Ms. Adele Fassbender for giving us Michael). 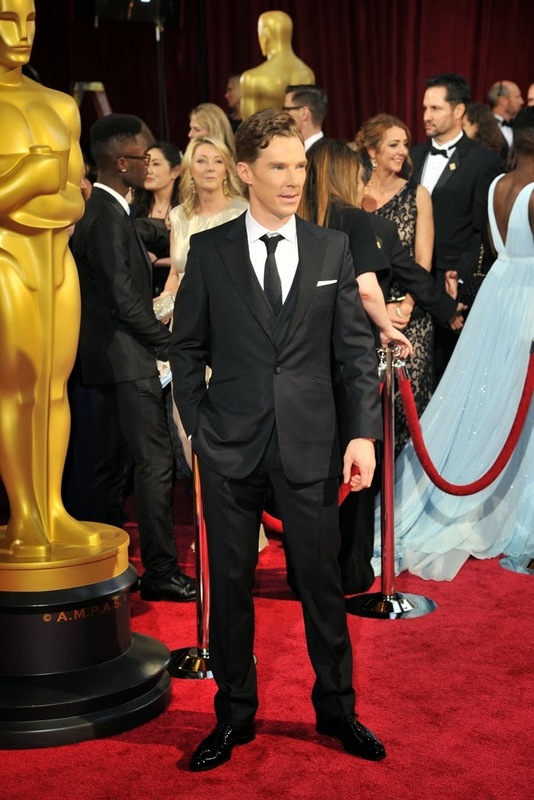 Last, but not least, Benedict Cumberbatch in Spencer Hart. Of course a Brit would wear a Saville Row suit and look dapper, wouldn't he?